Now I came across this amazing machine idea whilst I was writing my dissertation and thought (in the nerdy way that I do) just how amazingly cool this concept was. The Coca-Cola Freestyle. During my recent trip to Disney’s Wide World of Sports, Florida, I ventured into the sports bar and came across the machine, unfortunately I couldn’t geek out and spend loads of time selecting and testing (there was a queue) and had the cups not been of gargantuan size I would have been back for more. But it was just as wonderful in person as it looked on the coca cola blog. Why on earth is this not the drinks dispenser I’m presented with everywhere, and if not everywhere I’d settle for just Nando’s as I seem to frequent that restaurant more than is healthy, can’t say no to spicy chicken. So this machine allows you to pick whatever brand of drink Coca Cola owns and whatever flavour you want, I never knew there were so many to quote their marketing ‘the possibilities are quenchless’ but seriously EVERY flavour, who knew there were over 100! To which I say blooming bring more of those flavours over here it’s no fair! Peach Sprite, Lime Fanta, Raspberry Coca-Cola?? Those sound great, bring them over! Which would be your favourite flavour? I have to thanks Blair Fowler (juicystar07 on youtube) for this great song recommendation on her latest prom video, as soon as I heard it I knew I had to download it, I’ve been on a bit of a music binge lately…downloading songs on my walk home because it would be the perfect ‘walking home’ song! This song from Madilyn Bailey is great, I’m very tempted to buy the rest of the album, she also has a youtube channel you can check her out on, for now this is my favourite song, I hope you like it too. OH ME OH MY. 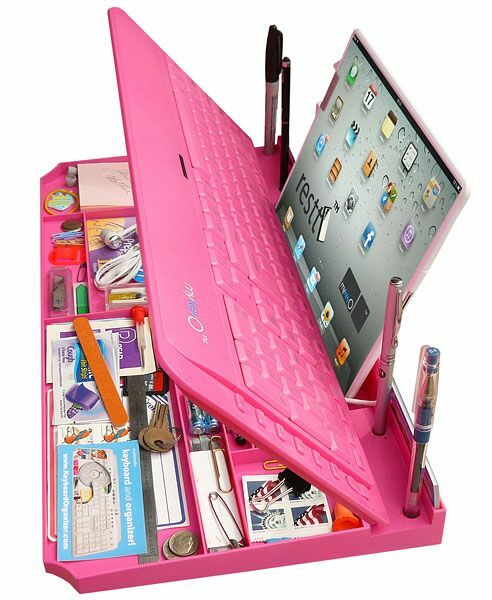 This below desk/organise/dock is literally just the thing my tidy little mind craves and it’s pink. I mean goodness, if anything had my name written on it, it would be this. Infact the only thing to make this more precious would be a monogram…ahhh! It has teeny compartments for paper clips and pen slots and post its, it’s the epitome something I would procrastinate myself organising and reorganing. And a round of applause to Pinterest for actually having the buy link attached to an amazing product! A good graciously long day and one which caffeine was my only solution. I have never been a morning coffee person and certainly not a morning person either. My coffee kick become necessary roughly 10 mins after I’ve finished my lunch time sandwiches. On the dot. 10 minutes later. My body is ready for an amazing nap. Unfortunately for me, and most working folk, my office does not have a nap area (though some offices do might I add!). So coffee is the ‘salvation for the schlump’…hmm…perhaps that could be my cafe’s slogan?! 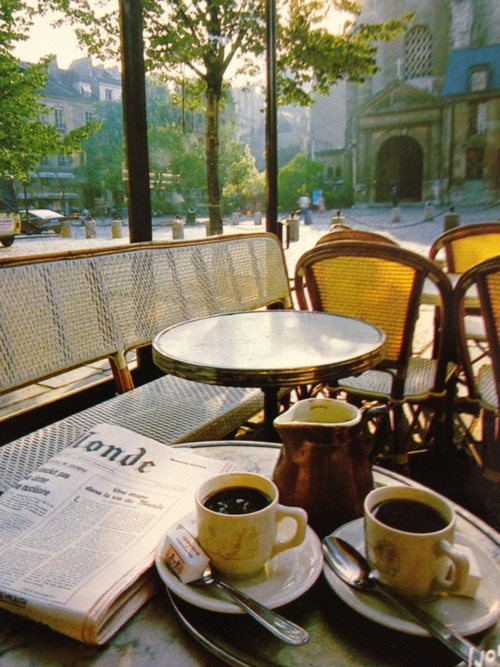 This wonderful picture of a Paris cafe is where I imagine myself popping to and sitting at as sip by sip my brain is hauled back into normality. What a beautiful view and perfect for people watching. That and the bracing wind that faces me on the walk back to the office! Now if you haven’t read Man Repeller’s blog then I seriously recommend it, she’s super famous in the blogosphere and fabulous and funny and fierce! To summarise her blog; “The Man Repeller is a site dedicated to the celebration of fashion trends that women love and men hate.” I think we all can relate to this happening to us at least once in our lives. “No, I haven’t decided to dress like MC Hammer, they’re harem pants”. In other news; Happy 50th Birthday to Marc Jacobs and RIP Maggie Thatcher. From the ever wonderful Chloe who first broke into my fashion scene at school with the Paddington bag, still haven’t got one. As spring really and truly has yet to fully spring, these boots are still wearable right now and choosing the grey colour allows one to categorise them with spring pastels and picture them with floral tea dresses when in actual fact we’re still reaching for black skinnies! Now there are a whole host of amazing design concepts out there that I would seriously LOVE to try (we’ve all heard about Google Glass) but this one may just top them all! 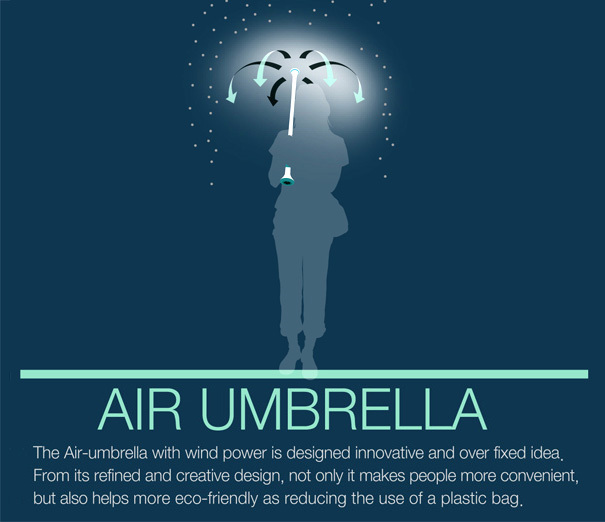 Well ok not really but this is seriously cool, it’s the Air Umbrella. I know, perfect for my neck of the woods. It pumps air from around the handle up through the pole and out creating an air based barrier to keep the rain off. It does away with the need of an actual canvas as well as ridding me of the embarrassment of ricocheting off objects because I decided to buy the biggest umbrella known to man in an effort to keep my whole body dry and not just my right shoulder! For more pictures check out this website here.